With a successful movie and a cartoon under their belt, a toy line based on America's favorite Supernatural Fighters was inevitable. However, due to a lawsuit by Filmation (who had owned the name Ghostbusters since the '70s when they had a live action show by that name) the cartoon and the line of toys changed their name to The Real Ghostbusters, since everyone felt that the movie and cartoon stars were the only Ghostbusters and to avoid confusion with the new cartoon Filmation was doing by the same name. We were treated to about 5 years of interesting figures, vehicles and lots of ghosts for the gang to bust. It began in 1986 with basic Kenner 5-point articulated figures of Peter, Ray, Egon, and Winston as their cartoon characters, as well as their vehicle Ecto -1, and the firehouse playset. Each figure was accompanied with a little ghost of some sort for them to chase after. This practice continued through all the different variations of the Ghostbusters. There were many variations, which was a Kenner tradition going all the way back to the first Star Wars figures. There were the Fright Features, where the figures did a Tex Avery cartoon-like expression by squeezing their arms or legs. This line included the first version on the team's secretary and honorary member - Janine Melnitz, who was to see 3 more versions done of her as the line continued. Super Fright Features were figures who did what the Fright Features did, only more exaggerated. Screaming Heroes would scream after you added some sort of spook to their backs and squeezed air into them. The line took lots of liberties in the appearance of the gang, putting them them in different uniforms and giving them equipment which for the most part never appeared in the cartoon or the movie. With the release of the second film, a new member was introduced. Louis Tully was the team's accountant and had a larger role in the sequel and eventually the cartoon. This lead to him appearing in the Power Pack line of figures of '89 as well as Slimed Heroes, where warm water revealed thermal painted slime on the figures only to disappear in cold water, and Ecto Glow lines where the 4 boys and he had uniforms which glowed in the dark. After the first season, the team had vehicles like the flying copter Ecto- 2, Ecto -3, a sort of lame little dragster car, as well as a new version of Ecto -1. The '89 version of the Ecto -1 was just the originial car with some new stickers added to it. Of course you can't forget the ghosts toys that were produced for the line. The first season began with two ghosts from the movie - an 8-inch Stay Puft Marshmellow Man and a green ghost figure (the one which made Bill Murry utter the famous line: "he slimed me!") who in the cartoon was known as Slimner. Slimer was the team's mascot helped set out the ghost trap for them. After these two all the ghost figures were completely made from out of the toy company's imagination and were not the ones the gang fought in the cartoon or movies. There were such wild ghosts as the Haunted Humans set, a series of ordinary looking civilians which transformed into strange monster ghosts. The most memorable spook from this set is Granny Gross, an old lady who gains a third eye and whose torso becomes a huge jaw with fangs when transformed. There were others as well, like a spooky upper skeleton torso called Bad to the Bone, and a killer toilet (i kid you not) known as Fearsome Flush. The gang even got to take on some famous monsters when Kenner released a vampire; Frankenstein's monster; werewolf; hunchback; mummy; and a zombie. 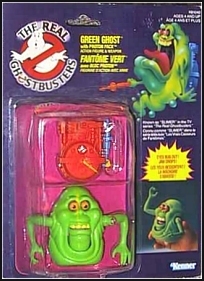 The ghosts never sold as well as the Ghostbusters figures and were often the first to be reduced for clearance. There were also some child-sized accessories like the Proton Packs and Ghost Trap that kids could wear to be a Ghostbuster in real life. There even were some stuffed plush toys of Slimer and Mr.Stay Puft. By 1991 the line and the cartoon had run it's course. A new line called Teenage Mutant Ninja Turtles had become a runaway hit and there hadn't been a new Ghostbusters movie since 1989, so Kenner decided to call it a day. Five years for any toy line is outstanding in an industry where two years of shelf-life is considered good. In 1998, they tried to revive the line with a new show called Extreme Ghostbusters. It was sort of a Ghostbusters, The Next Generation. Egon would return, though he now had a receeding hairline with a ponytail, to help train a new bunch of Ghostbusters. The new team consisted of Roland - who was sort of an Africn American version of Egon only younger, Kylie - a gothic chick who was dedicated to studying and exploring the supernatural, Eduardo - a Hispanic con artist type not unlike Peter back in the '80s, and Garrett - a daredevil despite the fact he was in a wheelchair, who loved basketball. With this new show came a series of figures made by Trendmasters. Egon; Eduardo; Kylie; (who came with the only accurate to his cartoon size figure of Slimer); and Roland were all transformed into action figures. For some reason there was no figure of Garrett. I'm not sure why. Trendmasters also released figures of the ghosts, like a large version of Slimer and Sam Hain, the spirit of Halloween who was a popular enemy from the first cartoon. The new cartoon and line of figures just did not have the magic the first line did. There hadn't been a new film in over 10 years and the old phrase "out of sight out of mind" seemed explain why nobody got excited about this new group. To fans of the first cartoon and team, there was really nothing new. It was just the same adventures with a new group. Fans were quick to spot who was the reissued Peter, the Egon, the Ray and the Winston from this new team. After one year the toys and cartoon faded away. Interestingly enough, the final cartoon featured the first group teaming up with the new gang to stop some ghosts, and so ended Ghostbusters. Today, the first four figures of the gang can bring as much as $20 dollars complete in package. Figures of Louis and Janine also do well because they did not get as many figures made of them. The ghosts and some of the variations of the team do not seem to be as popular as the original gang and therefore do not command the same prices. One of the most sought-after pieces is the Firehouse Playset, which can bring about $100 dollars complete on online auction sites. The line of Extreme Ghostbusters toys have yet to increase at all and can still be bought at clearance prices in some places. The figure of Kylie, however is usualy a little higher due to being the female of this new team. To all who grew up in the '80s, the line brings back a special memory. It was a decent seller in it's time, and did well enough to stick around for all the years it was made. Just about everybody knows that when ghosts are haunting you (or your toys) there is only one team, and for kids and collectors one action figure line, to call - The Real Ghostbusters!